Before purchasing a used Nissan 370Z, there are a couple of things you need to know about the automobile. When looking for a new or used car, you first have to learn about the make and the model. 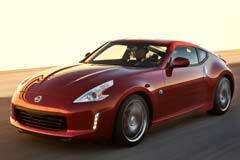 The Nissan 370Z was announced in late 2008 and was in production by 2009. It took the place of the very popular Nissan 350Z. The 370Z is a sports car that comes as a 2-door coupe or a 2-door roadster. The automobile has a powerful 3.7L V6 in either 7-speed automatic or 6-speed manual. Although this particular model faces some fierce competition, it is still very appealing, especially for younger automobile buyers. The design has received many great reviews. It has been hailed for the sleek aesthetics by many car reviewers. It ranks as one of the top affordable sports cars. The main negative thing consumers have said about this particular car is that it produces a lot of road noise. However, for some people, this is not a deterrent from purchasing the vehicle. 2014 370Z Touring 2014 Nissan 370Z Touring Magnetic Black Metallic AVAILABLE NOW!! 2018 370Z Sport 2018 Nissan 370Z Coupe Sport Passion Red AVAILABLE NOW!! 2012 370Z 2dr Coupe Manual 2012 Nissan 370Z, Monterey Blue Pearl with 72119 Miles available now! 2014 370Z 370Z / AUTOMATIC / LOW MILES 2014 Nissan 370Z, Magma Red Metallic with 17844 Miles available now!